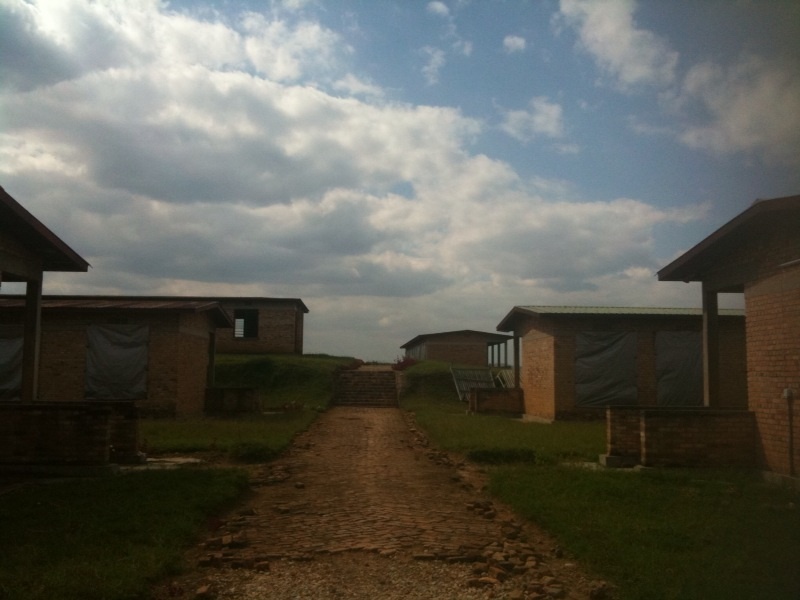 today was an interesting day going to the Genocide Memorial in Murambi. An American student who is working for We-act, is doing some research and needed ‘our’ yoga-time for her surveys. It’s a pity, but for me an opportunity to join my two Swiss friends i met here in Kigali for a day trip to Murambi. Maurice, our driver, took us there. Once out of Kigali, this beautiful land became even more visible. It’s truly the land of the thousand hills. There are so many hills. On the hills there are people working in the fields, i saw many banana-trees and Aloe Vera plants bigger than I am. Amazing.. Some day i hope to be able to grow my Aloe Vera this big… The car is driving fast, all the cars do, and it’s a bit scary. Not too scary, but it kept me focused on the road as well. After a little while we say two buses on the street, they were in a car crash. A small local transportation bus and a big bus. We were told that the accident happened the day before and the big bus was the one that drives students from and to Kigali from the Rwandan University. The little local bus was crashed in a way, that you wouldn’t believe that anyone would walk out there alive. Sad. Then we arrived in Butari. Here we stopped to eat some lunch. When we stopped, immediately my eyes caught this boy came walking towards us from a distant. I looked at him and winked my eyes and looked again. What was i what i saw? What was this kid having on the sides of his head? When we came closer it became visible that he had something growing behind his ears, so huge, his ears were not visible anymore but it looked like a big spiral-donut kind of shape on each side of his head. Poor kid! And i really felt pity for him. Was nobody helping him? Wasn’t there any doctor seeing this kid thinking he should help? And i was realizing that if everybody thought like i did right now, no one is helping him, by thinking someone else should do it. As fast as he was there, he was gone again. He didn’t really beg, he was just there and away. These kinds of thoughts i have often, but it’s impossible to act on everything. Back on the road, we continued our journey into the hills. I realized how exhausting it must have been for all the people running in these hills. The French writer Jean Hatzfeld described this in a very impressive way when he writes about the Genocide in his book The Strategy of Antelopes. A story written as experienced by the victims and the perpetrators. The ‘hunters’ and their ‘prey’! They were running, running, running and kept running, chased with machetes like animals. If they didn’t run (hard enough) because they were tired, hungry, sick, weak, old, mother with baby or anything that it meant you would die for sure. If you would run, it would increase the chance to live a little. But i cannot imagine running for hours, days, weeks in hills like that, without food, not knowing where your family is or if they were still alive. Then we were getting close to the Genocide Memorial in Murambi. A big open space on a hill, in a gorgeous area, a very peaceful atmosphere and a quiet dirt road would get us to the Memorial. We parked our car and a friendly woman was awaiting. She introduced herself and explained what was going on here, 15 years back. She told us that this was an old school, a technical school. During the genocide men was told that they and their families should come here, because this place would have been protected. Here you were safe. Many people did. I forgot the exact number of people came to this school area, but thousands. Right then, they were locked up in the (class) rooms. And for two weeks, they did not get food or water. Many people died already and the ones who didn’t were very weak and easy to kill! They were all slaughtered there. After that they were buried in mass graves. The lady at the memorial was going to show us around. One row of classrooms were now used to make this massacre visible for everyones eye nowadays. Right after the genocide, they were digging up the people from two mass-graves and treated them with special ‘powder’. This was to kept the bodies in tact so the proof would last (longer, not forever. Many bodies need to get buried again now, probably in 10 years all these bodies here are gone). Even visible was the reactions of fear and pain in their bodies. Peoples skin and faces were still a little visible but for sure the way the body was laying on the ground, their toes and fingers pressed together in many cases, still fear was written from these bodies. How can a human do this to another human? It’s totally unbelievable. Also seeing this was unbelievable. Writing it down now still makes my stomach turn around and i can still smell that smell in my nose. Little children, adults, no hand, arms, feet… legs turned around in unnatural angles, skulls broken on many ways.. horrible!! Right there i saw what evil means. A report produced in 2000 was created after research on mental health problems in Rwanda. National Trauma Survey by UNICEF in ’95 talked about the effect on children affected by the genocide and the numbers above are results from that test. So this is about children, the future! We were quite. Seeing this is interesting but devastating. After, we walked on this campus and the lady was pointing out a row of rooms. She told us these were the rooms where the French military slept when they came to help, right after the genocide finished. They pulled up a French flag in the middle. A few meters from their beds was a grass-field. The lady told us that on that field is a huge mass grave. Also on that same field the French ‘helpers’ build a volleyball net and played volleyball together. On the graves where people were buried a day before. They didn’t help, they played. I have no idea what that was all about, i mean… They came to help and did nothing! It just adds, were it was already all hard to understand, why like that? Why not help? Why even play instead? On a field of horror a day after it stopped? After this we went back. Again driving trough these beautiful hills, and now even more to think about and even more to imagine what happened in these hills. On our way back we drive by Rwanda’s National Museum of Arts and History and we decided to check it out while we were already here anyway. It was interesting to see, it would bring our minds also a little back from all these negative and horrible thoughts from the Memorial. Interesting was to see how the people used to dress in leather cloth, they would hunt, woman only wearing a small cloth and crazy jewelery on their legs, arms, bodies. The weapons for hunting were hand made of wood and iron like bow and arrow, spears and knifes. They made huts to live in… All the typical things you can imagine. 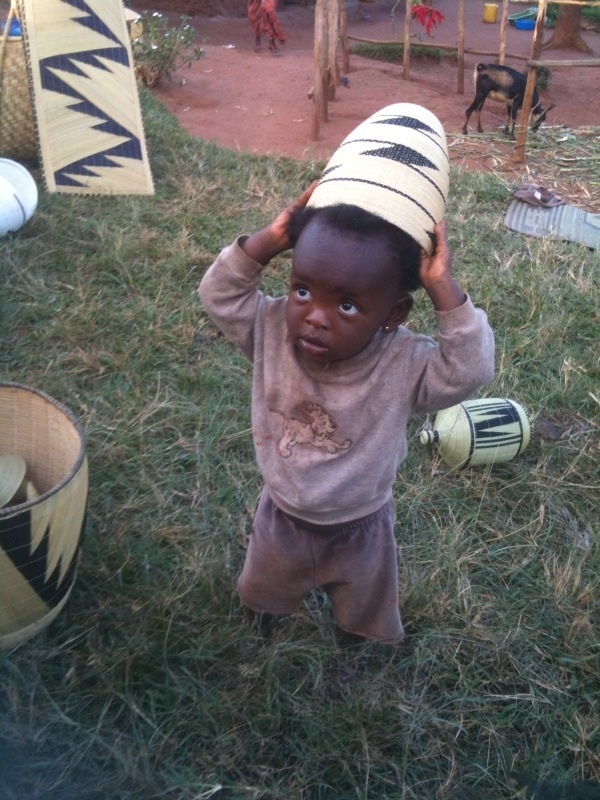 Traditional dancing, big clay pots for food and milk etc. It was beautiful to see but what was seriously a little mind blowing for me was, that some of these pictures and subjects dated from for example 1953! Hello, that’s the year my mum was born! It must have been such and amazing big differences back then between our civilization and theirs. If i didn’t see these dates i would have guessed these pictures and subject and all were from… i don’t know, 1400-1500?! For sure not 1953! 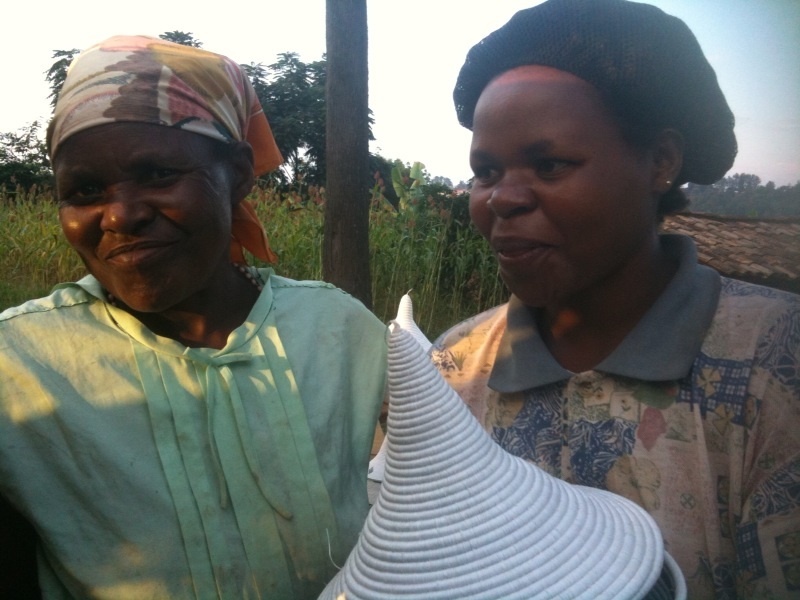 And then home to Kigali…On the way back we bought some hand made woven pots from the side of the road. What i found very very nice, was that after i choose 2 small ones and paid, the woman was friendly and gave one more in my hands and said it was a gift! It seemed to come straight from her heart, it felt very sweet. These women are very poor and giving something without expectations i found very beautiful. Then, very tired i was and after dinner i tried to just write or read something, but instead i was knocked out and fell asleep pretty fast.